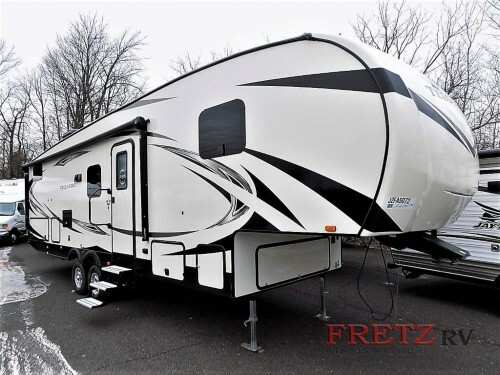 Take a look inside this Starcraft Telluride 296BHS fifth wheel for sale here at Fretz RV! This amazing dual slide floorplan comes with enough space to sleep up to seven people as well as plenty of luxury amenities while still being a half ton towable, lightweight RV. This way you can enjoy more comfort without the added stress that comes with a towing a heavier camper. 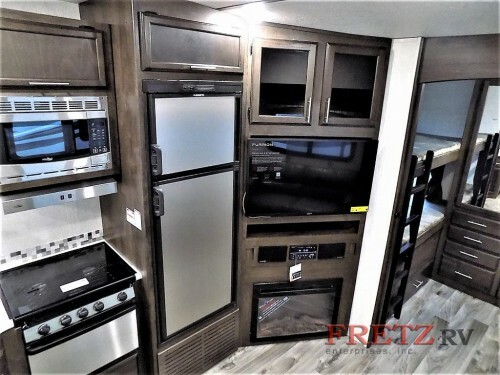 Let’s find out all that you will get in this convenient and family friendly RV. Check out this Starcraft Telluride 296BHS Fifth Wheel! As soon as you step inside this Starcraft Telluride, you will see plenty of residential style and quality amenities. Take the kitchen for example with its stainless steel appliances. Cooking and storing your meals will be so easy in this beautifully modern space. Plus, with the first slide located in this main area, you will have room for extra sitting and sleeping space with the booth dinette and convertible sofa, both of which will have a perfect view of the 40” LED TV and built-in fireplace. Get more luxury amenities in the spacious interior. One key feature of this fifth wheel that makes it special is the inclusion of a bunkhouse. This space will come with not only a set of bunk beds but also a wardrobe to accommodate the storage needs of a large group of people. With the master bedroom located at the opposite end from the bunkhouse, you will get the privacy you need. 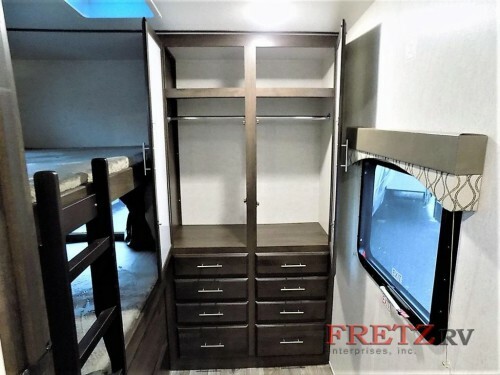 And you are sure to love the queen bed with individual reading lights and multiple storage spaces including the second slide filled with dresser drawers and a linen cabinet. Bring along more in the bunkhouse floorplan. Last, but not least, you will love the addition of the exterior kitchen to give you more ways of enjoying the beauty of nature around you. 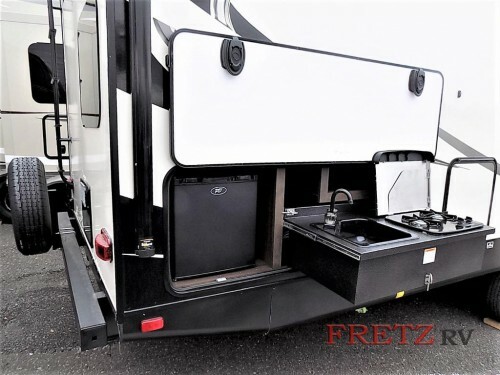 The convenient pullout range and sink will assist with all of your cooking needs, and with an extra mini fridge located here, you can have quick and easy access to a cold drink or snack all day without having to head inside the camper. Enjoy more time outside with the additional exterior kitchen. As you can see, there are so many things to love about this lightweight Starcraft Telluride 296BHS fifth wheel. And right now, we are offering a special Internet price, so be sure to contact us or stop by our location to find out the deal you can get to take it home today!